Assistant Professor Chen Huang and Associate Professor Biwu Ma. Imagine a family of butterflies fluttering around in a controlled lab space. Except, the butterflies aren’t really butterflies. They are molecules designed and produced at Florida State University as new functional materials that have a wide range of applications from molecular sensors to light-controlling devices. This is the scene in Associate Professor of Chemical and Biomedical Engineering Biwu Ma’s lab at Florida State University, where he and Assistant Professor of Scientific Computing Chen Huang are working together to create brand new materials. Published today in Angewandte Chemie and featured on the journal’s front cover, Ma and Huang describe how these rationally designed molecular butterflies can emit different colors — blue, red and white by control. Those colors translate into different levels of energy, which can be used in a variety of ways. With these precisely designed molecules, the team also plans to learn how to better control and direct larger quantities of energy, and convert photo energy to light, electricity, heat or even molecular motion at will. Their research efforts will lead to the development of better materials and more efficient devices, such as sensors, light bulbs and solar panels. Last year, Ma wrote in the same journal about the first molecular butterfly that he had created in his lab. He had discovered that it could “flap its wings” to create two states of photo excitation, a process called photo-induced structural change, leading to dual emission of blue and red at a certain ratio. Usually, a molecule has only one excited state and emits one color light. The fact that this molecule did both made it extremely unique. So, what would happen if there were a family of molecules, Ma and Huang wondered. Ma, hired by FSU in 2013, and Huang, hired in 2014, have different focuses. Ma is an experimentalist, which means exactly what you think. He likes to go into the lab and start making materials to see what happens. Huang, in contrast, is a theorist meaning he focuses on the mathematical equations and background of why materials act the way they do. They set about combining their different backgrounds to start tweaking the original molecular compound that created the first butterfly. In the end, they wound up creating several molecules that varied ever so slightly from its brothers and sisters in chemical composition and size. Huang said with computational tools they were able to discover how to design these new molecules and get them to act precisely the way they wanted. They could create different wavelengths of energy at different times, simply depending on the design of the molecules. 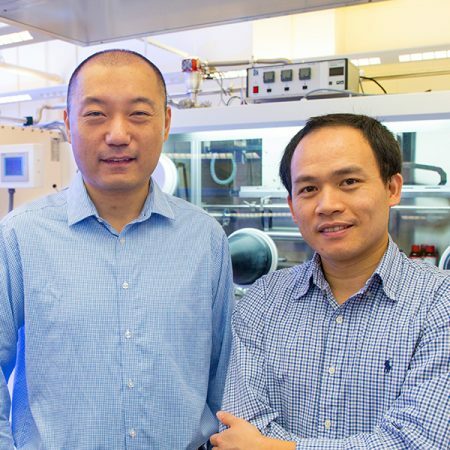 Ma and Huang’s research is funded by FSU. They are part of the university’s Energy & Materials Strategic Faculty Hiring Initiative begun several years ago to build up scientific discovery in this burgeoning field. Thus far, 11 tenure-track faculty have been hired in six different academic departments. Other FSU authors on the paper are Chenkun Zhou, Yu Tian, Zhao Yuan, Mingu Han, Jamie Wang, Lei Zhu and Maliheh Shaban Tameh.